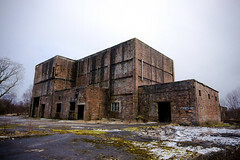 ROF Bishopton was the former Royal Ordnance Factory Bishopton, an explosives ROF built by the Ministry of Supply during World War II. One of sixteen similar facilities created by the Ministry. No production went to the Royal Navy during World War II, as the Admiralty had demanded its own propellant factories. Following the closure of the Royal Navy Propellant Factory Caerwent, in 1965, ROF Bishopton started making cordite for the Royal Navy. The factory was built to manufacture propellant, mainly cordite, for the British Army and the Royal Air Force. Work began in 1937, on a site chosen to utilise the expertise in munitions manufacture established in World War I at the nearby Georgetown Filling Factory which had employed over 10,000 workers in 1917. The site comprised of three explosive factories, Factories I, II, and III, with Factory 0 being the administration and support facility. It occupied an area of some 2,000 acres (8 km�). Construction began in 1937, with the full facility being opened between December 1940 and April 1941, large enough to be served by its own bus service, serving some 20,000 workers. The period from commencement was extended due to the need to provide three water mains to the site: for fire-fighting, production processes, and drinking water. 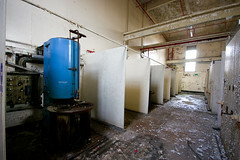 Together with the factory, building works also included housing and facilities for the personnel. The factory contained some eleven miles of standard gauge railway line, serving its own fleet of nitric acid wagons, with its own diesel locomotives for shunting. These were used to move wagons between the transfer sidings and various locations within the site. There was also a further 55 miles of 30 inch (760 mm) gauge railway lines for transporting explosives around the site. This section of the former MoD facility shows some of the network of narrow-gauge tracks used to transport materials round the site. A private railway junction just north of Bishopton Station provided a standard gauge link with the main line, and this ran the complete circuit of the property. From sidings, components used in the manufacture of propellants were delivered, then transshipped to the extensive narrow-gauge network of tracks that reached almost every building and bunker on the site. This area formed part of the former Royal Ordnance Factory at Bishopton. 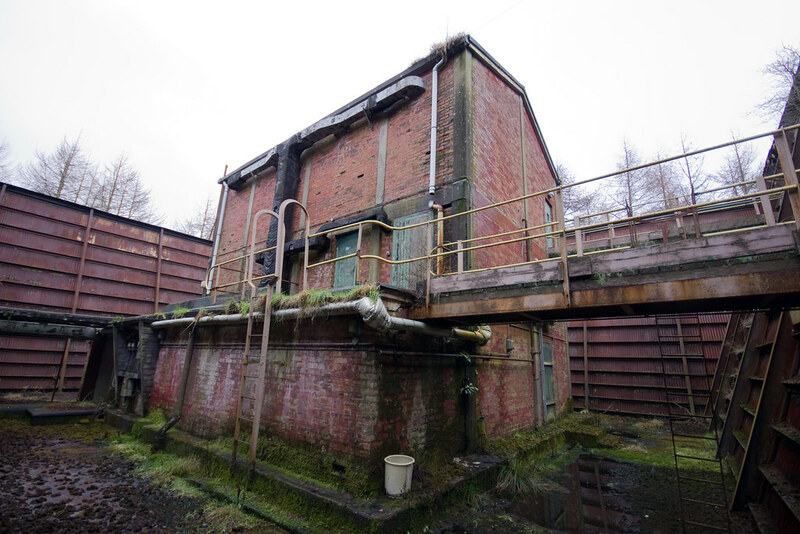 BAE Systems now operate this site and are preparing it for a gradual handover to civilian use. With thanks to BAE Site Remediation for access. The site was privatised in 1984, becoming Royal Ordnance PLC, then RO Defence in 1987. 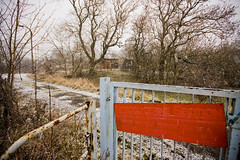 Explosive manufacturing continued on the site until the MoD began to procure its materials from South Africa, and production finally ended in 2002. The site was renamed BAe Systems Land Systems, with BAe employing a section as an Environmental Test Facility. Since the production ended, BAe has sought to have development plans approved which would see the see the creation of 2,500 homes, a business park, community woodland park and community facilities, but have been blocked by the lodging of over 2,000 objection regarding concerns of contamination remaining on the former munitions factory site. In 2006 the Scottish Executive enacted rarely-used powers to order a review of plans, focusing on contamination issues and the impact of the development, and in December 2008, outline planning consent was granted after an independent report found insufficient cause for concern. Detailed planning consent was also given for a related motorway junction off the A8/M8. Councillors voted in favour of proposals which will see the creation of 2,500 homes, a business park, community woodland park and community facilities. Subsequent Health and Safety evaluations have shown that the site was also a safe place of work, with no incidences of ill health arising from the work. This differs significantly from similar facilities operated during World War I, where the workers (mainly women) suffered from numerous ailments as a result of handling the production materials. These problems are discussed in further detail in our article about Devil's Porridge. Given its function, Bishopton's accident record was generally exemplary, and mishaps were generally uneventful. One exception occurred in February 1956, when Paisley was rocked by a major explosion at the Bishopton factory. A huge nitro-glycerine wash-house exploded, sending a cloud of orange and yellow smoke hundreds of feet into the air. 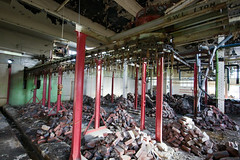 The blast smashed surrounding windows, and people working at the factory were thrown to the ground and covered in debris. Despite the fact that more than 30 people were within 50 yards of the explosion, only one man was killed. 19 workers were injured as roofs were torn off buildings within a 300 yard radius, most being struck by flying debris, with some of the casualties caused by material from the cordite section landing more than half a mile away. As with nearly all MoD related sites, Ordnance Survey maps did not show its existence in Renfrewshire until the mapping was revised around 2000, when most sites that had previously been censored were finally shown. Dargavel House lay within the factory perimeter, generally unseen as public access was forbidden to the munitions facility. The house is described as a large, late-16th century mansion built on a Z-plan. Although there has been considerable alteration and addition to the original, this maintained the original architectural style. The original part of the house comprises the main block which lies approximately east-west, with circular towers projecting to the northeast and southwest. The roughcast walls rise to three storey, surmounted by an attic. A renewed panel dated 1584 is inserted in east gable, and a sundial dated 1670 is set in the wall of the southwest tower. This delightful mansion is owned by BAE Systems, and formed part of the former Royal Ordnance Factory facility at Bishopton which effectively took over and adapted all the buildings on site as part of the business of manufacturing armament propellants. BAE Systems now operate this site and are preparing it for a gradual handover to civilian use. The house is in relatively good repair, and will eventually be incorporated into local community use. With thanks to BAE Site Remediation for access. Each factory in ROF Bishopton had it's own nitroglycerine section, each with two nitroglycerine hills - six hills in total. A nitroglycerine hill is gravity-fed as it is not possible to pump such a sensitive explosive - nitric and sulphuric acids are added to glycerine at the top of the hill, then the products flow through several washing and acid recovery stages to the bottom of the hill. A drowning pond was used to quench the process if anything went wrong. All that can be seen of the factory II hills is a circle of trees where the drowning ponds were situated, but factory I and II hills are much more complete. There were two serious nitroglycerine spills in factory I in 2001 - one involving a leaking pipeline that was not detected for some time. Also known as guncotton, nitrocellulose is the other constituent part of cordite. Bales of cotton waste were passed through a teasing machine, dried, then nitrated with a mix of nitric and sulphuric acids. This was then steeped in large lead-lined vats to allow the nitric acid to penetrate the fibres fully - then excess acid was removed by centrifuging and several stages of washing and boiling, before being pulped in a Bertrams beater - very similar to the beaters used in paper pulping. The manufacture of nitroglycerine and nitrocellulose requires large quantites of nitric and sulphuric acids. These were made on-site - each factory had it's own acids section, and spent acids were recovered and replenished for reuse. Nitric acid was made using the Pressurised Oxygen Process (Haber-Bosch) to produce ammonia, which was then oxidised to produce the acid. Spent acid was allowed to settle in a giant tank, before being filtered and replenished with fresh acid. 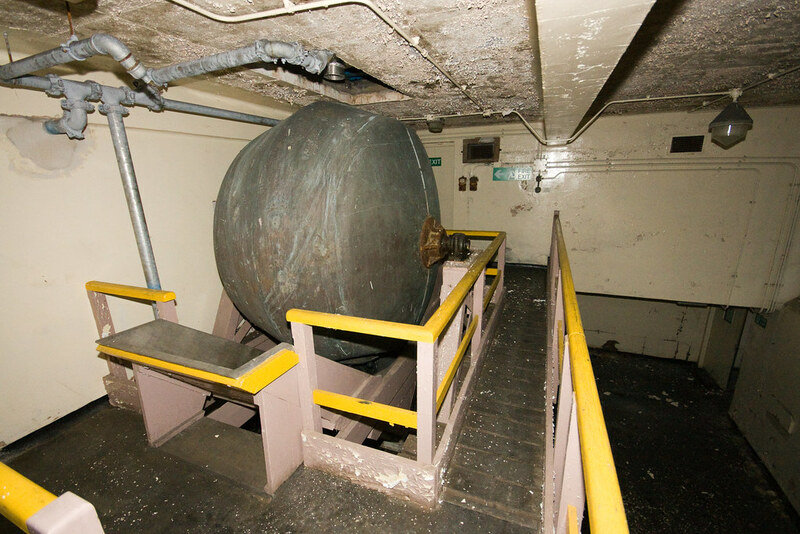 The picture shows one of the acid settling tanks - to give an idea of scale, the white tank wall is about 3 metres high. Cordite was processed in a number of ways - a common way was to extrude it through a press into long rods, which would then be bundled together to make up the propellant charge. These rods varied from very thin ones used in small-arms ammunition to large ones used for heavy shells and as rocket propellant. The presses for medium-sized rods were commonly called Tangye presses, and these would be housed in a press house - a long earth bermed building with individual bays for each press. The presses were driven by motors behind the back wall of each bay, in a service corridor, and heavy rope blast curtains would offer some protection to workers. 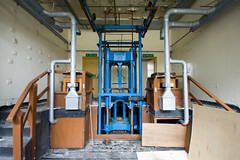 Cordite would be pressed damp, and the extruded rods would be cut to length on a table as they came out of the press. Propellant for naval uses was granular, not in the form of rods - it was first dried in a gun propellant drying house ("stove") then transferred to one of two drum blenders. These buildings are some of the most distinctive in ROF Bishopton (see below) - iron-clad blast walls enclose an inner building which houses the blender itself. The blender is on three levels - ingredients are brought up by lift and loaded into a hopper on the top floor, the copper drum itself is on the middle level, and the outlet is on the ground floor. 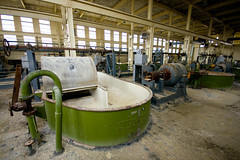 The blender is controlled from outside the blast walls, so no workers are in the building while the blender is running. Picrite (nitroguanidine) is an explosive that was often added to propellant - it produces a large amount of nitrogen which reduces the muzzle flash and temperature, and when blended with nitroglycerine and nitrocellulose produces triple-base propellant. 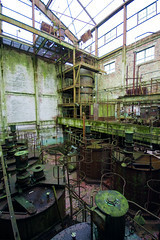 ROF Bishopton had one Picrite section next to the factory II acids section, with a very distinctive building known as the "cathedral". The cathedral has now lost its roof, but most equipment is still in place. White phosphorus was one of the few filling operations carried out at ROF Bishopton - mostly the explosives were shipped to filling factories to be made into munitions. The white phosphorus section filled 120mm shells, 81mm mortars and grenades. An overhead conveyor was used to transfer the filled munitions from painting to drying to stencilling. Some ammunition systems have the propellant enclosed with the projectile in a shell - so-called quick-firing (QF) ammunition. Others have the projectile loaded into the barrel first, then the propellant charge in a separate package - often called breech-loading (BL) ammunition. For this, the cordite propellant needs to be packaged into one easy-to-handle unit that will burn up completely - the Combustible Charge Container (CCC). 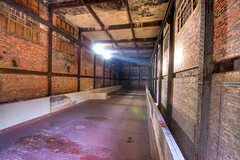 Situated next to the white phosphorus section in factory II, the CCC section has beaters and vats similar to the nitrocellulose sections, but in addition it has equipment for pressing the containers, a laquering production line, curing ovens and other equipment needed to make the finished containers. The various presses and punches were enclosed by steel blast barriers. 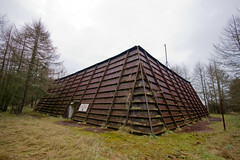 Especially in later years, ROF Bishopton was a centre for the dismantling and disposing of old ammunition, and this was mostly carried out in factory III to the west of the site. Two large boiling-out houses, the "Big Steamie" and "Little Steamie", were used to steam the explosive out of the shells, and the explosive was then burnt on one of the large burning grounds nearby. ROF Bishopton also handled the decommissioning of the Lance missile system, a US-made missile that was sometimes nuclear-tipped, though the warheads were removed before transport to Bishopton. Thanks to Google mapping tools, it is now possible to look at the former ROF Bishopton site and study the detail of the facilities and safety measures built in to the construction. Much of the expected separation of the various buildings on the site can be seen, together with the earth banking which would have acted to deflect any blast and debris upwards and away from adjacent buildings. However, there are many features and ground markings/tracks that are not so obvious with regard to their purpose, and the view provides much of interest to consider. One building of interest in the satellite images is the larger drum blender. Corrugated-iron-clad blast walls are thinner and stronger than earth berms, and allow escape routes at several levels of the building. This building is part of Factory I. An alternate view has been forwarded, which provides additional detail. This does not appear to have come from any online services we can access and identify. 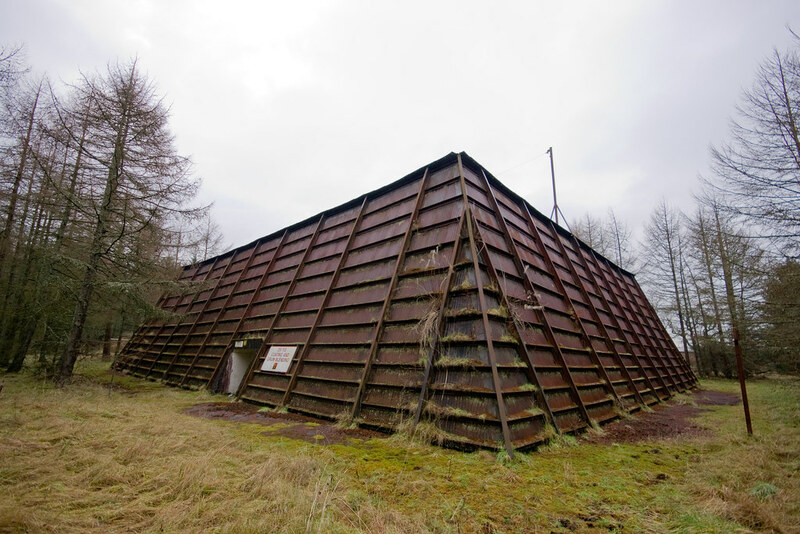 While examining aerial views of the former Nobel Explosives Factory at Ardeer, a very similar walled structure was found in the woods to the north of the site. Make the best of this satellite imagery while it is available. The area will be recovered for development at some point, and developed. Housing will obscure most, if not all of these interesting features one day, and Google will update their images. A Google Earth file containing plans of ROF Bishopton, including perimeter fences, standard-gauge and narrow-gauge rail lines, waterways, buildings and descriptions of different areas of the factory has been created by a visitor with extensive knowledge of the site.